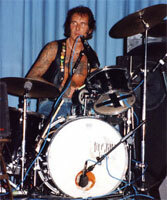 Batteur Rock 'n' Roll Anglais, Wild Bob Burgos, "The Tattooes Sledgehammer of Rock n' Roll", a fait parti de nombreux groupes dont The Rapiers, Matchbox, Shotgun, Wild Angels. Bob Burgos was born in South-East London and began playing drums at the early age of 8 years. His main influences in Rock n' Roll and Rhythm and Blues were (and still are), the fabulous Chuck Berry and Jimmy Reed. Wild Bob was born to an English mother and Spanish father and the "gypsy" blood drove him to the artistic side of life... painting, drawing, sketching and musical talents. All of his drawings were of Rock 'n' Roll scenes and so, he began having these Rock 'n' Roll scenes Tattooed on his body... front and back, head to foot, hence the "Tattooed" Rocker was born. He began his professional career playing drums at the age of 18 years and Rock 'n' Roll became his entire life. He played with various bands and was soon booked seven nights a week. He smashed his way through songs with a couple of drumsticks that sounded like sledgehammers beating out the beat. He was on his way! 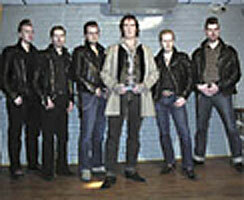 Wild Bob became well known backing big name artists and playing with such bands as Screaming Lord Sutch and The Savages, The Countbishops, The Wild Angels, Heinz of the Tornados, Wee Willie Harris, etc..
After backing many other bands, he went on to form a group with a band called Matchbox that used the old Carl Perkins hit as their name. After much rehearsal to get the true feel of original Rock 'n' Roll they went on the road and became a huge success and recognized on the Rock 'n' Roll scene as one of the Best! Their popularity grew to the point that they were doing performance after performance, day in day out, touring across the world, cutting records and having major hits that demanded more travel. This naturally took its toll being away from his family and when Wild Bob's father passed away, he went home to sort it all out. No doubt he felt guilty that he had spent so much time on the road away from his family and he needed time to decide what direction his music was taking him. As he Worked his way through depression of losing his father, he realized that Rock 'n' Roll has become his entire life and rocking was something he just had to do. Rock 'n' Roll had him in its grasp and he soon joined the Piano Rocker, Freddie Fingers Lee and the ball started rolling again. He began writing and doing sessions with Freddie, Matchbox, Jim Carlisle, Stuart Coleman and numerous other artists. He began to be called upon to back American artists on tour in Europe such as Charlie Gracie, Gene Summers, Mac Curtis, Clarence 'Frogman' Henry, and his idol... Chuck Berry. What a thrill that must have been! ???? SP ? (?) I'M A ROCKER - I'm A Rocker / ? ???? SP ? (?) ? / ? ???? SP RIDGEMOUNT ? (UK) . 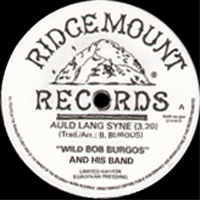 Wild Bob BURGOS & His BAND - Auld Lang Syne / ?